Sally's Window of Scraps . : Tuesday Throwdown and A Day for Daisies!! Happy Tuesday Friends!! Team B is supplying your inspiration over at Tuesday Throwdown with images from our awesome Sponsor this week - A Day for Daisies!! I adore their images and this week I chose to use this beautiful Castle image "Where Dreams Come True". Our Challenge this week is to make a project using the Spotlight Technique. I had never used this technique before and actually had to head over to Youtube and view a couple of Tutorials. I found them very easy to follow and LOVE the effect!! I will definitely be using this technique again and again!! This will be for a sweet little girl's 7th birthday... May All Your Dreams Come True!! 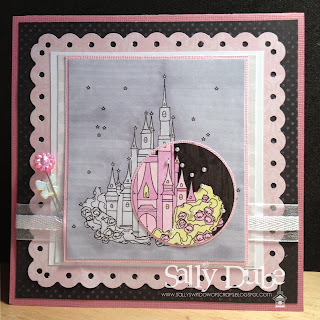 I'm posting this card in the Make it Monday Challenge - Always Anything Goes. I hope you will head on over to Tuesday Throwdown, check out the rest of the DT creations and play along with us... Can not wait to see your projects!! Sally your spotlight just jumps right off the page. Love it! That spotlight adds so much interest! Beautiful colors too, Sally! Oh Sally, this is magical! I absolutely love the way you included the spotlight on your card and the fun black and pink color combo is perfect!! Oh yummm....it's a magical candy castle. How I wish I could move in! A sweet sweet card, Sally! This is gorgeous Sally. Love the colours and the great spotlighting on the image. I spotted you over on MIM and came for a closer look and I am so glad that I did. I love how you've used the spotlight technique on this card! Lovely colors and design, really beautiful! I spotted your card on MIM. WOW, Sally - what a stunner! The image is beyond beautiful! Love it! Have a blessed Sunday, my friend!